Our accommodation in Loch Lomond boasts beautiful, modern rooms all on the ground floor equipped with free Wi-Fi, LCD TV, alarm clocks, hair dryers, comfortable beds and tea and coffee making facilities.With rates starting at £65 per night for a double or twin room, including breakfast. We welcome customers from everywhere, whether you are interested in hill walking, golfing, water skiing, or a sailing enthusiast or someone who just wants to appreciate the beauty of Loch Lomond. Formerly the local County Police Station, my home has 5 bedrooms all en-suite and are decorated to a high standard. The premises are situated in the heart Balloch and just a stones throw from stunning local scenery. We have private off street car parking available for our guest's. Your host, Cath, has many years' experience in the hospitality trade, and will always provide a very high standard of service, both with accommodation and the quality of food. 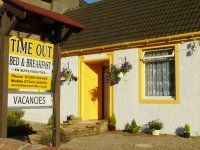 To make a reservation or for any additional enquiries, please do not hesitate to call us here at Time Out B and B and we will do all we can to help. Alternatively, if you prefer, email us with your questions by sending them to: timeoutbb@yahoo.co.uk and we will be more than happy to furnish you with any initial details. We look forward to hearing from you. Phone today if you require en-suite rooms all on the ground floor in Balloch.